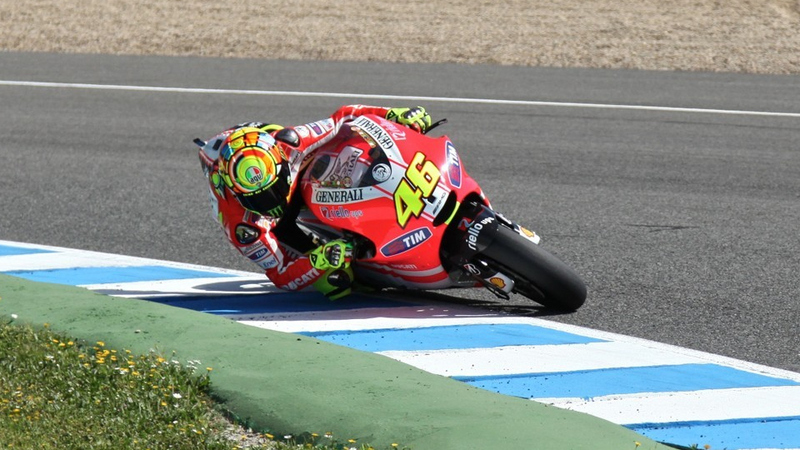 1) at 0.21 somebody appears to be inserting something up Valentino's arse. 2) at 0.28, the least necessary caption in the history of the moving image appears. 3) at 0.41, the sound of the exhaust mysteriously disappears, presumably to stop rival teams figuring out rev limits and what have you OR because the funny little "mic" on the camcorder just picked up the sound of noisy wind blast, like every other amateur home video. 4) at 1.10, at the point we're all dying to interpret his reactions, there is a carefully chosen shot where Valentino looks neither happy nor unhappy, thus keeping us all in suspense for just a little longer. 5) at 1.14 they seem to be choosing which graphic equaliser visualisation they'll opt for next year. Overall, there are a disappointing lack of machine guns, oil slick dispensers and rocket boosters on display, leading us to think the 2012 regs NEED TO BE RE-EXAMINED QUICKLY. they don't need guns, etc. it's VALE. On a real bike! This means he'll be able to start eating again! I'm so ready for big bikes again, as I'm sure are all the big racers who've had to starve themselves to get anywhere near the power/weight ratio the little boys enjoy. Still, it's unnervingly quiet. I want lap times, discussion, etc. Chris Jonnum, tell us pleeeeeeeze! What's it like?!?!?! De Puniet Caught Testing TwitGP2 Bike! GET YOUR TWITGP2 PADDOCK PASSES HERE!